And I'm still not to the bottom of it. Depending where I look, steel, aluminum, brass, and various plastics all have very different reported resistances to ethanol, or more commonly referred to "E85" in the context of an automotive fuel - 85% ethanol/15% gasoline. One study says that it's fine with steel, another says that it's not. One study says it's terrible with brass, another says it's fine. I'd like to run an aluminum tank for weight reasons. Some studies say aluminum is fine, others say absolutely not. "From the corrosion standpoint, aluminum can have some issues when you get into 85 percent ethanol," said Mike Bartush, product manager, environmental systems for Cincinnati-headquartered OPW. "We offer an anodize product that coats these materials so that there's not a problem with these alternative fuels." I suspect part of the problem with test results, for us at least, is that they're testing metals in pure ethanol. It's unclear to me how 15% gasoline would skew the results, but I'd expect it to help reduce corrosion potential. I also emailed Fragola about their fittings. All of our fittings are E85 Compatible. But you’ll want to get into our 6000 Series PTFE Hose and Real Street Hose Ends to plumb cars using that as their fuel source. The PTFE Liner won’t break down like a CPE, Synthetic Rubber. I can't speak for the cheaper AN fittings on the market but at least Fragola fittings are ok for e85 use. Again, this may not help you out a lot Kurt, but any information is worth sharing at this point right? This is what a guy on one of the forums had to say. Chemist checking in. Alcohols are not necessarily more corrosive to rubbers etc., it is just that cars were designed to withstand petrol, not alcohols. All the gaskets etc. can be reformulated to withstand alcohols and in modern cars often are. Some metals such as magnesium and possibly aluminium alloys are corroded faster by alcohols than water. This is probably because water initially gives a tight oxide protective layer after the initial attack. Alcohols do not and the corrosive attack (essentially metal + alcohol = soluble metal alkoxide) continues. To stop this, a little water is added to the alcohols which restores the oxide layer. Some ideas of my own. A simple fact about Ethanol. Ethanol on its own is hygroscopic, in other words it attracts and absorbs water from the air. If you accept the above that a little water would help prevent it from promoting the corrosion of aluminium parts you might think this is a good thing. The addition of a little water would promote the corrosion of steel parts. Apparently once the ethanol absorbs some water it starts to lose its solubility in the Gasoline and the fuel could separate so adding a little water won’t work in a blended fuel anyway. Ethanol produced and sold as fuel should have corrosion inhibiting additives in it but I’m not sure these are effective for aluminium. Ethanol has a PH that is very similar to water so its acidity shouldn’t promote corrosion of either steel or aluminium parts. If it was mildly alkaline this would probably be better for inhibiting corrosion but it isn’t. Ethanol is also a polar molecule like water but with a polar and a non polar end allowing it to mix with both polar and non polar substances though not at the same time it would seem. In fact the US Department of Energy’s Oak Ridge National Laboratory warns against the use of Zinc or Aluminium with Ethanol. An extract from one of their reports! Note; - this study was for E20. Further comment from the study. Testing was conducted with both unleaded and leaded gasoline as well as those two fuels mixed with 20 vol % ethanol and 1 vol % corrosive water. * Test temperatures were maintained at 55 ± 2°C (131°F) for metals, elastomers, and plastics. The components were immersed for up to 2000 hours. Testing determined that several metallic fuel system components were significantly degraded from contact with E20. Rust was found on metal surfaces in/on electric fuel pumps, fuel injectors, and fuel regulator diaphragms (see Figs. 3.5–3.7). The potential exists for the rust to become dislodged and clog fuel filters or settle in areas where mechanical components move, increasing wear rates. Accelerating the wear rate of bearings may lead to premature failure of components in these items. The fuel pump’s aluminium casing was found to be vulnerable to pitting from immersion in E20 (see Fig. 3.8). Pitting was also found on aluminium surfaces of carburettors (see Fig. 3.9). Corrosion products from this pitting could block fuel metering devices, which in turn could lead to engine stalling and/or deteriorated driveability. Tarnishing of brass and copper components increased when they were immersed in E20. In parts such as the fuel pump commutator, armature, and brushes, the corrosion products could increase wear rates, leading to premature component failure. These copper and brass pieces also carry current. 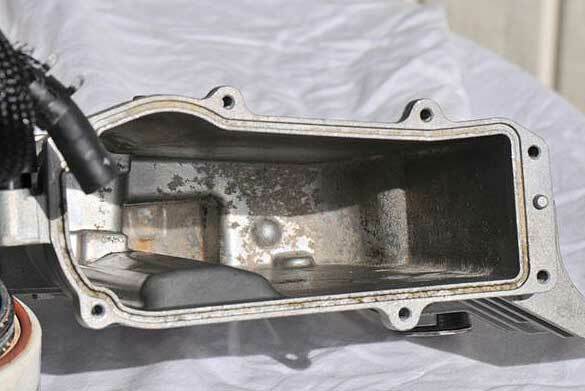 If excessive corrosion were to collect on these parts, resistance could increase, causing decreases in fuel pump speed and pressure output, which in turn will limit engine output and vehicle performance. They say aluminium is not appreciably affected yet have some corroded aluminium parts. Note; - 5xxx and 6xxx aluminium alloys are aluminium magnesium and aluminium magnesium silicon alloys respectively.I would think if magnesium is such a problem you should avoid these particular alloys. I find it surprising that E85 wasn't also used as a test media, and if the 15% gasoline content is enough to slow or stop aluminum corrosion. That report was done back in 2007 or 2009 and the test vehicles were all older Australian cars. I don't think E85 became readily available in Australia until 2010. Not many cars have aluminium tanks but some boaters use aluminium tanks and have to deal with ethanol. The effect of ethanol gasoline blends on aluminum fuel tanks is being seen by marine service technicians in the field. It appears that corrosion of aluminum fuel tanks is occurring and the aluminum of the tank is being carried away in the fuel, where it manifests as seen in two images below. 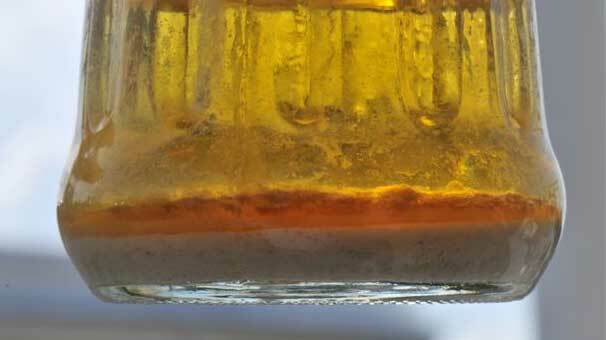 A silvery sludge from a fuel filter where a residue of aluminum particles appears to have been trapped by the filter. It is believed that these effects were caused by ethanol-gasoline fuel in which a phase separation had occurred. The E10 fuel itself is not believed to be harmful, but if phase separation occurs, a more concentrated solution of ethanol and water lies on the bottom of the tank, where it can strip the protective oxide layer off the aluminum and cause pitting and corrosion. Further, it is believed in saltwater area the concentrated ethanol can combine with chlorides to make an even more aggressive mixture. The influence of saltwater is an interesting consideration. Boaters in the midwest have been using ethanol fuels for a decade or more, and in general have found problems with aluminum fuel tanks to be minimal. The recent spread of ethanol blended fuels to saltwater boating areas, however, has produced more problems. The effect of saltwater on the ethanol may explain why coastal boaters are having more problems than inland freshwater boaters. The first potential impact from ethanol starts with the product drop, and with components like the fill pipe. "From the corrosion standpoint, aluminum can have some issues when you get into 85 percent ethanol," said Mike Bartush, product manager, environmental systems for Cincinnati-headquartered OPW. "We offer an anodize product that coats these materials so that there's not a problem with these alternative fuels. We also changed some of our gaskets about five years ago to be more compatible with the new fuels. When you're talking about five or 10 percent ethanol it's not an issue with our aluminum tubes and aluminum adapters. And it's not an issue with our cast-iron shear valves and steel piping and brass. We take all the different fuels and we soak our products in them and test them." Bartush noted that the company was making an effort to change various castings to stainless steel in order to alleviate any potential problems with more aggressive fuels, relying on an economy of scale to help keep costs down. There are few direct ethanol issues with tanks, both steel and fiberglass. "As far as compatibility goes, there's nothing we're putting into a tank that's going to have a problem," said Charles Frey, Jr., a vice president at Stoystown, Pa.-based Highland Tank. "An advantage is that you're not going to get much water in the tank because ethanol is going to absorb a certain percentage of the water and it provides a little bit of an improvement for fuel quality." Ethanol at E85 levels can impact various metals like aluminum, plastics and rubber. This OPW overfill valve would have anodized aluminum components for use with high concentrations of ethanol. I know this probably doesn't offer any more clarity on the subject. It seems blended fuels have a co-solvent additive in them to combat "phase separation" and when water reach's a level where this can no longer do its job and the fuel separates then problems occur. Water may also supports microbial growth which may be the source of acidic by products in the fuels that others have alluded to. Oops quoted the same article you quoted. Sheds some light on why ethanol isn't piped. Aluminum’s resistance to corrosion comes from its oxide layer that forms on its surface this aluminium oxide layer requires an acidity/alkaline neutral environment to be durable. If the fluid in contact with it is acidic it will react with the oxide layer forming an aluminium salt and water the acid will then react with the underlying aluminium forming an aluminium salt and hydrogen. The aluminium-oxide and acid are consumed in the reaction. Aerobic breakdown of ethanol/gasoline would basically be an oxidative process releasing amongst other things water and CO2. Many Microbial organisms that breakdown materials will produce acidic by products. It’s unclear to me if Ethanol blended fuels will transport oxygen to the (water ethanol)/gasoline interface of phase separated fuels. Water on its own can transport oxygen. Anaerobic breakdown will be by the formation of lower energy compounds. Since aerobic breakdown releases a lot more energy if oxygen is present it will completely take over from any anaerobic activity. I remember when someone who shall remain nameless put some diesel in their gas car. I drained the now diesel gasoline mixture from their tank into a steel drum and set it aside. The mixture went rotten and formed a volume of water on the bottom of the drum which then rotted out the bottom of the drum and started to leak. The fuel was dry when it went into the drum and the drum was new. Gasoline and diesel are both vulnerable to getting a bug in the fuel but it’s quite rare. High alcohol fuel blends are reputed to cause corrosion of aluminum fuel system components. However, studies indicate that the addition of water to the high alcohol fuel blends helps prevent corrosion. This is shown in SAE paper 2005-01-3708 Appendix 1.2 where gasoline/alcohol blends of E50, nP50, IP50 nB50, IB50 were tested on steel, copper, nickel, zinc, tin and three types of aluminum. The tests showed that when the water content was increased from 2000ppm to 1%, corrosion was no longer evident except some materials showed discoloration. Note: - that if these samples were sterile no microbial action would have occurred in these experiments. If water supports the formation of a stable oxide layer on aluminium and dry ethanol doesn’t this also fits. If phase separation occurs at water levels some where above 0.5% as has been indicated at 1% more aggressive blending additives may have been used to prevent phase separation. Water is not supposed to be a problem until phase separation occurs. The hard anodizing advocated by some for corrosion protection doesn’t seem like it would necessarily be a durable solution against acid attack. The thicker oxide layer would take longer to dissolve and would neutralize more acid in the process and so would buy a bit more time but ultimately would succumb just the same. If the hard anodizing is via the formation of a corundum crystalline surface this could have superior resistance to acid attack. The corundum crystals themselves are fairly chemically inert and highly resistant to acid corrosion but wouldn’t I imagine form a homogeneous layer over the aluminium substrate. Anodizing doesn’t protect against galvanic corrosion. Just a thought... In the world of (older) motorbikes and especially when restoring them, small fuel leaks are often found coming form the tank itself. As it is often quite expensive to replace them, there are all sorts of products out there to (re)seal the tank from the inside using a coating. You simply disassemble the tank, clean it, plug up the openings, put the product in, slosh it around and let it dry. And mostly with good results, a thin layer coats the inside of the tank stopping small leaks and helps prevent further leaks and corrosion. At least some of them (atleast Red-Kote that I know off) claim ethanol and methanol resistance and therefore should hold up well. So basically your original fuel tank will provide the shape and rigidity, but the fuel will be held by the coating on the inside. Might be an easy and cost effective way of making your aluminium fuel tank better resistant to Ethanol. I've used POR's Cycle Tank kit on 5 bikes now, it does a great job of prepping the metal and sealing up pinholes. I only run E0 in my old bikes so I can't say anything about its ethanol resistant properties. I got a reply from a chemist, who explained that ethanol itself isn't a problem, it's the water. More exactly, it's bacteria growing on the surface of the water globules, that excrete acids which are the root cause of the corrosion seen. Interesting.